Dead End in Norvelt, written and read by Jack Gantos. Grades 4-7. Macmillan Audio, 2011. 7 hours and 16 minutes. Review copy provided by my local library. Norvelt is a dying town. Subsidized by Eleanor Roosevelt as part of the New Deal to help poor people get back on their feet, the original residents are reaching an age where it's not unusual to read their obituaries in the morning paper. And all those obituaries are written by the inimitable Mrs. Volkert, herself an original Norvelt resident. A sassy old lady with a penchant for history, the only thing slowing Mrs. Volkert down is the crippling arthritis in her hands. And that's where Jack comes in. In trouble for shooting one of his father's old guns from the army, Jack is grounded for the summer, except when Mrs. Volkert needs his help to type up obituaries. And when people start to get suspicious about the deaths of so many original Norvelt residents, Jack will have to help solve that mystery, too! 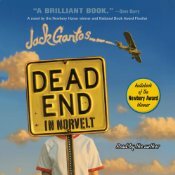 Blending fact and fiction into a semi-autobiographical novel about his own childhood (the town of Norvelt is real, Jack really suffered from terrible nosebleeds as a kid), Dead End in Norvelt, is a story about examining one's own past and learning from history and also figuring out how to embrace change. It's entirely fitting that a book with those themes would feature elements from Jack Gantos's own childhood, and I'd imagine that looking back at his own past helped Gantos make the story even more meaningful. Jack Gantos is a boy obsessed with story and with history. Part of the reason he bonds with Mrs. Volkert is that she insists on adding paragraphs to each obituary, loosely connecting some forgotten moment in history with the life of the person who has died. Another reason is that she lets him drive her car, but that's neither here nor there. The town of Norvelt is so richly developed that it almost becomes another character in the novel. By the way, Norvelt is a real place and it really was built during the Depression to improve the lives of poor people. Norvelt, once a model community, is now a dead end. It's not growing and flourishing; the population dwindles as the residents die off one by one. But it's also a place with a rich history and that makes it valuable to those wise enough to know it. I listened to the audio recording of this title and that was a great way to experience this book. Jack Gantos narrates, which fits the story perfectly since it's such a personal story. The reading is a little weird and quirky, but if you've ever heard Gantos speak, you know that's just how he is. The reading wasn't voiced, but it felt authentic. The audiobook includes an interview with Jack Gantos answering questions about the book and his writing. Dead End in Norvelt was the winner of the 2012 Newbery Medal and the 2012 Scott O'Dell Award for Historical Fiction. The story has a lot of humor and I think it will appeal to guy readers. I'd hand it to fans of the Grandma Dowdel books by Richard Peck because of this historical setting and the quirky old lady character. I'd also hand it to fans of Okay for Now by Gary D. Schmidt, which is another book set in a small town in the 1960s with a strong male character (although the tone of Schmidt's book is darker). Check out more reviews at Reading Everywhere (audiobook review), Book Nut, GreenBean TeenQueen, and the Nerdy Book Club. Dead End in Norvelt is on shelves now!